Do you have someone who has a birthday coming up this month or next month? People who have birthdays close to Christmas often say they feel left out when it comes to their birthdays and people get one gift to cover both events. 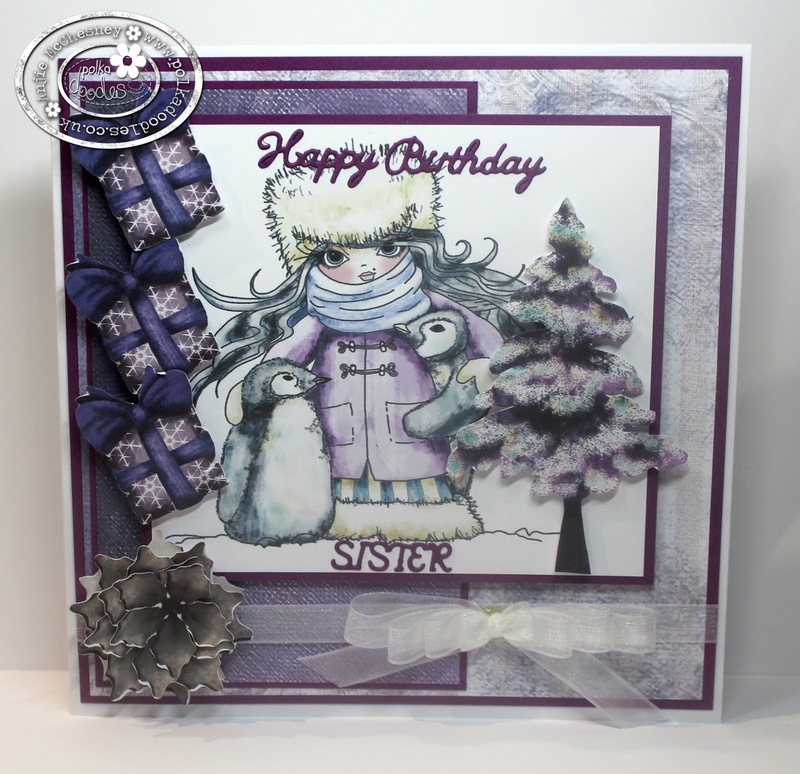 So we thought we would let them know they are not forgotten about by us crafters, and infact we will make them a special something to celebrate the fact that they have a Winter Birthday! 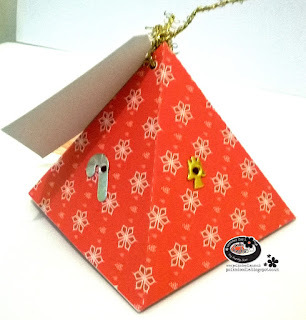 You can make anything you like, maybe a card, a scrapbook layout of even home décor. You can use any products you like to enter as long as it follows the theme for this week. We don’t have many rules but check them out in the side bar if you need to. We give you two weeks to enter so that means the CLOSING DATE IS 8th December 2015 and the winners will be announced on 15th December 2015. Julie -- Polka Doodles has so many wonderful Winter/Christmas collections that can be used for this Winter birthday theme. 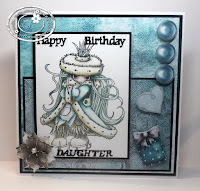 I used one of the design sheets from the Octavia Frosted Winter Collection to create this card. It's available both in Digital Download (instant gratification) or CD. I fussy cut lots of layers, then used 3D foam tape in-between. The sentiment is one of the many freebies in the Polkadoodles store. Have you snagged them yet? Tanya Hello there. For this week's winter birthday theme I've coloured one of the adult colouring book sheets from Colour Therapy Collection 1 Florabunda which is available on CD and download and a full list of the all the collections can be found HERE and HERE, because not only you can buy them in sets of three there is also the fabulous Colour Therapy Colouring Club. I've used Graph It pens amongst other things in shades of blue and purple which always remind me of winter. Look forward to seeing your makes for this challenge. Monica.- Birthdays are always related to presents. 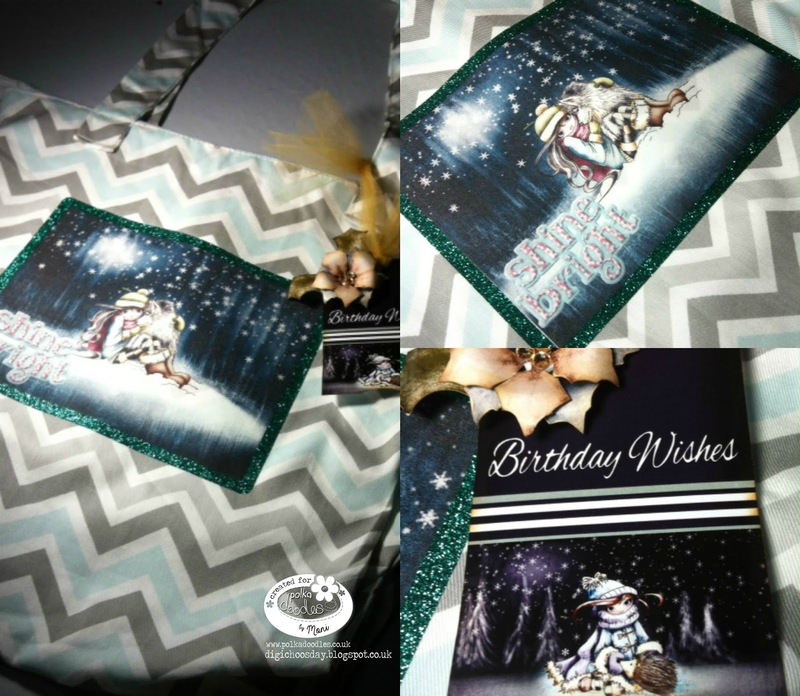 For this week project, I print one of the precoloured images included on Octavia Frosted Winter, "Husky Hugs" over printable cotton fabric and applied to a chevron fabric bag. To add a final touch I print one of the tags included in that collection, add some flowers and leaves and a birthday sentiment. 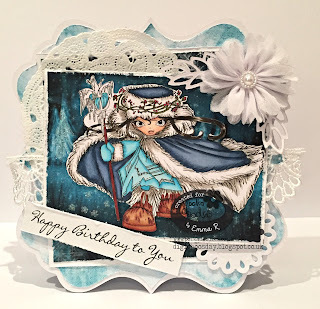 Aunty Sue - Now Winter Birthdays close to Christmas can often get neglected. 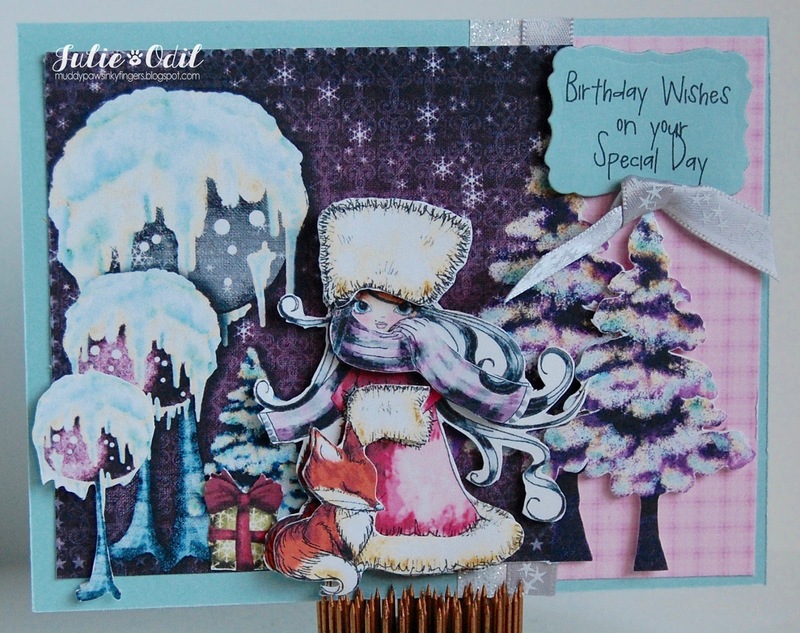 So for my Special Winter Birthday card I have used Octavia Frosted Winter and Twiggy & Toots CDs and made a winter scene. All printed onto Ultimate Graphic paper available in the shop here. As you can see this is for my Dad whooooo (sorry had to be done) has a birthday the week before Christmas. 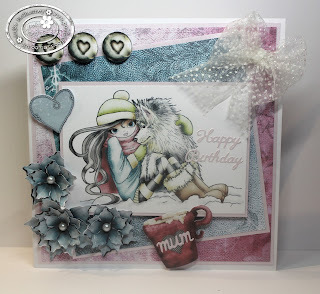 Emma - brrrrggghh its getting colder here so its a perfect time to get out the Octavia Frosted Winter Collection for my Winter Birthday card. 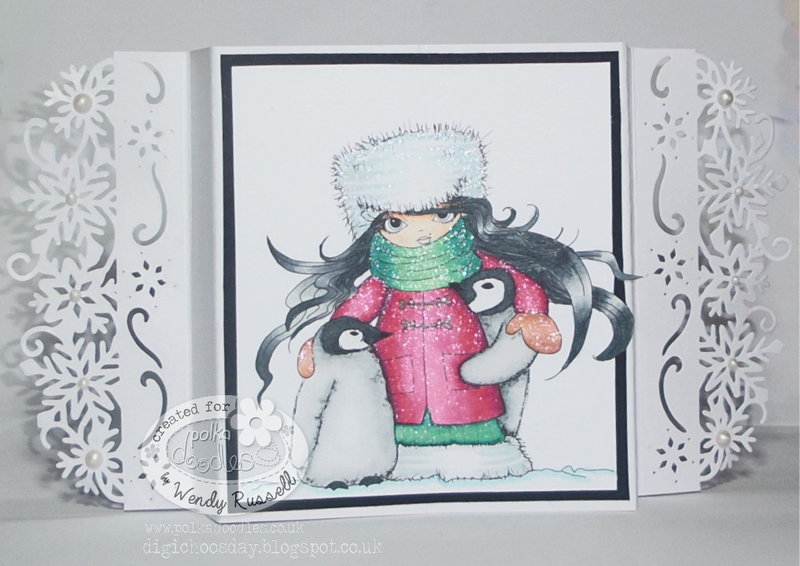 I have used Arctic Winter Start who can be found as a single digi Here, I have coloured her up with Copic's. 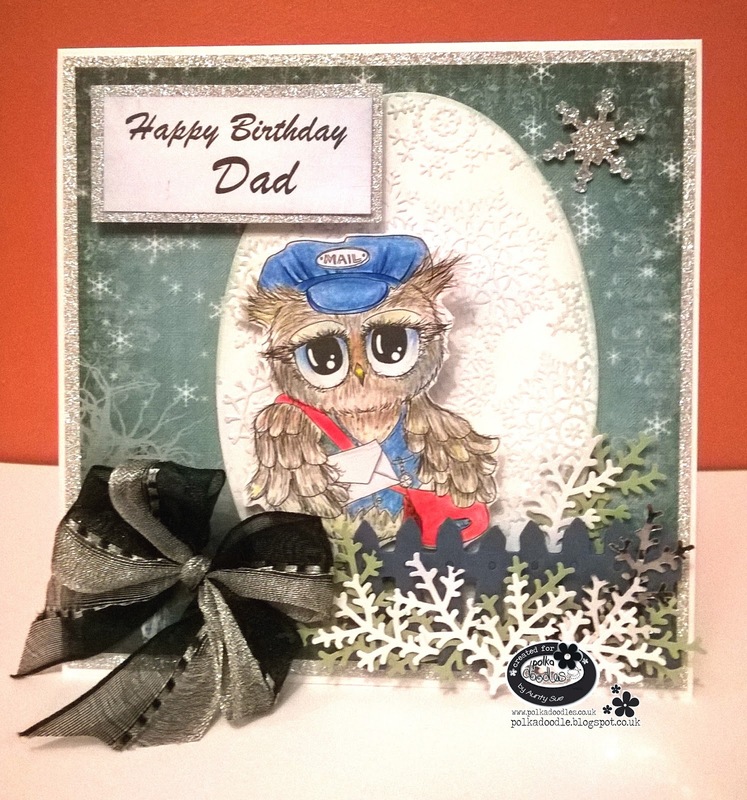 All of the papers are from the full Frosted Winter collection that can be found Here. Audrey chose Party, Birthday, Celebration Twiggy and Toots for this week's winter birthday theme. 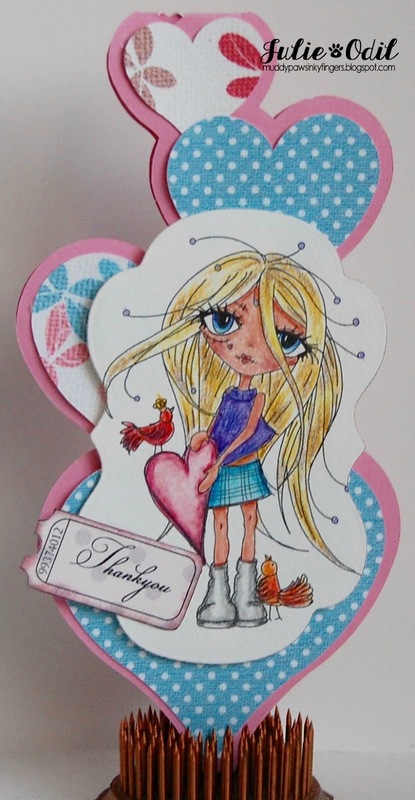 The image is also included in the Twiggy and Toots Owls Digital Download Collection. My sentiment is also from Twiggy and Toots Owls Digital Download Collection - I cropped it from the ticket sentiment sheet found in the collection, then made the background transparent in Gimp editing and changed the lettering color to white. I then mounted it inside the heart embellie from Frosted Winter Octavia Digital Download Collection. 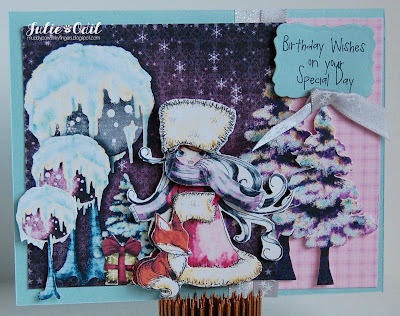 My papers and frosted tree are also from Frosted Winter Octavia Digital Download Collection. 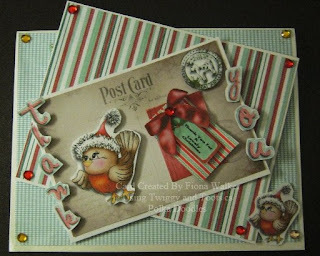 Helen - I've used papers and a pre-coloured digi from the 'Work and Play 5 - Festive Hollybobs Full Download Collection' and the 'Birthday Wishes' downloadable sentiment digi stamp. 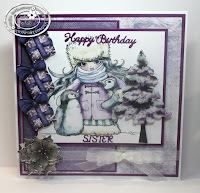 Anjie - What better to use for this challenge than the fabulous Octavia Frosted Winter Collection! You can also buy this on CD HERE, and in separates HERE. And as it is my Mum's birthday on the 28th I need to make three cards for her so here they are. Everything other than the die cut sentiments are from this collection, it really does have everything you need in one place. This is the one from me. And these are from my Grandma and my Aunt for my Mum. 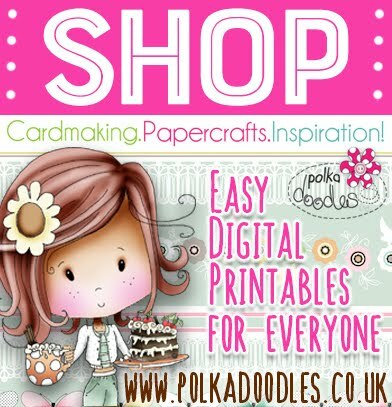 Please email us at sales@polkadoodles.co.uk quoting DCW044001 to claim your prize of £5 worth of downloads from the digi store! Did you see the news about the Colour Therapy Club? 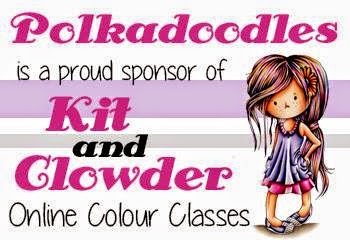 If not go check it out HERE - amazing value this non subscription club works out at just £1 a week for some fabulous newly released colouring pages. Go check out all the finer details HERE. And last but not least Gail is joining our DT from this week. I’m sure you’ll all join us and welcome her aboard! So we want to see your makes that thank someone for something. 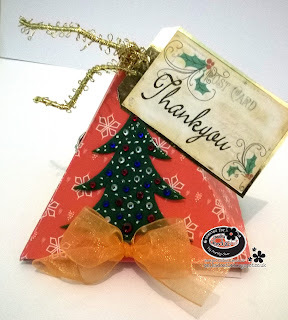 Maybe you could get a start on your thank you cards for any gifts you may receive in the coming months, or maybe you just want to thank someone for being a friend. Whatever you like as long as it is a thank you. We give you two weeks to enter so that means the CLOSING DATE IS 1st December 2015 and the winners will be announced on 8th December 2015. PRIZE: The random winner (chosen by Random.org) will receive £5 worth of downloads of your choice from the digi store! 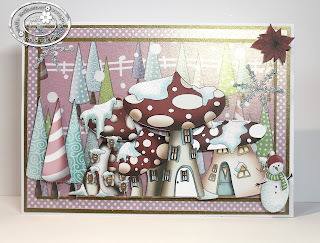 Julie -- I love all the Oddella Icky Inks, so when I had a chance to color one, I jumped at it, and used Oddella Heart. The papers and the Thank You ticket are from the Rose Budd collection. It's available in CD and Digital Download. 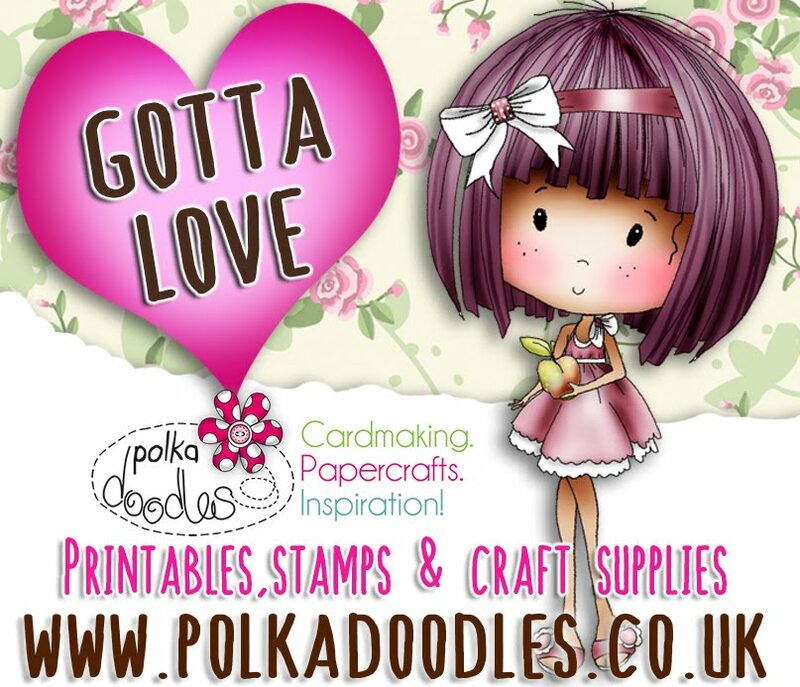 Gail Seriously into making super size tags and just loving the Ickyink Oddella digi so have used Oddella with Bag. The music sheet background papers are from the Work & Play 8 - Feel the Music collection, it fitted my idea for the tag perfectly, available as a digital download or on CD. I also used the polka dot paper from Sundae of Seasons, available here. Monica.-I believe in living a life with a grateful heart, so I love this week theme. 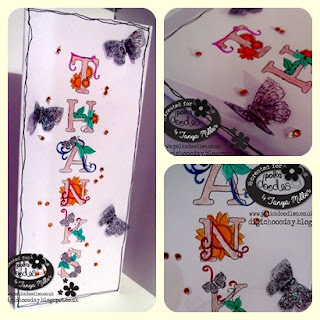 My make is a 15 inches door sign made with the stunning precoloured elements from "Autumn/Fall Digi Stamp Bundle". I used 2 layers and some curling on leaves and petals to add some dimension. The letters are from Picknix.-In the Garden. Fiona - Thank you to all the design team and everyone for their great welcome I am really enjoying my time being on the GDT. 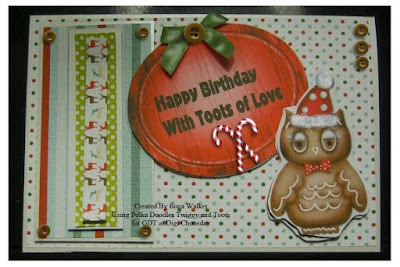 Here is my make for this weeks challenge I have used Twiggy and toots festive fun cd everything you see apart from the gemstones you can find on twiggy and toots cd available to buy from the store. Emma - I have dusted off my Oddella digi this week & have coloured her up with Copics. You can find Oddella with bag Here, I have used the brilliant papers & embellishment from the Twiggy & Toots collection that can be found Here. 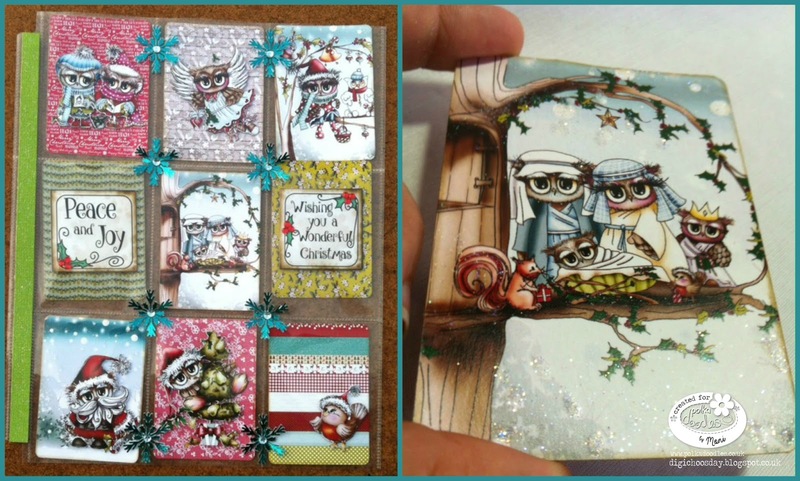 These papers go so well with any digi & were just perfect for this card. Aunty Sue - Well I am sure we all have someone to thank so my little make is a BOX which i will add a little something in as a extra for one of my little helpers at Christmas. The template for this box, the sentiment postcard and the paper is from our fabulous Work & Play5 Festive Hollybobs available from the shop HERE. I am thinking thats these would make a fabulous advent calendar. 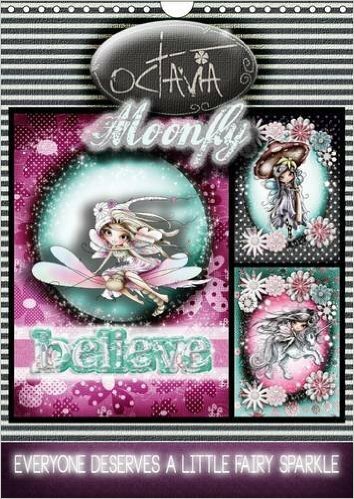 Audrey has chosen Oddella Fairy for my With Thanks creation. She is colored with Copics. I used a frame, sentiment and the purple polka dot paper from Eden Big Kahuna Digital Download Bundle - you can find all the frames only in Eden Collection In the Frame Bundle, the specific paper I chose can be found in the Eden Collection Paper Heaven 5 Bundle as well and all the sentiments are also located in the Eden Collection Say It All Bundle. 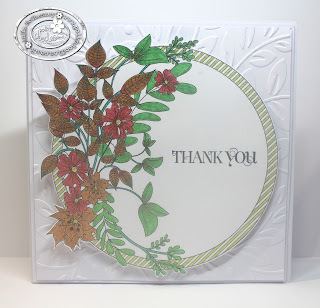 My kraft colored design paper with flowers is from Winston Deluxe Full Collection and the green flowered paper is from Work and Play Volume 11 Digital Download Collection. 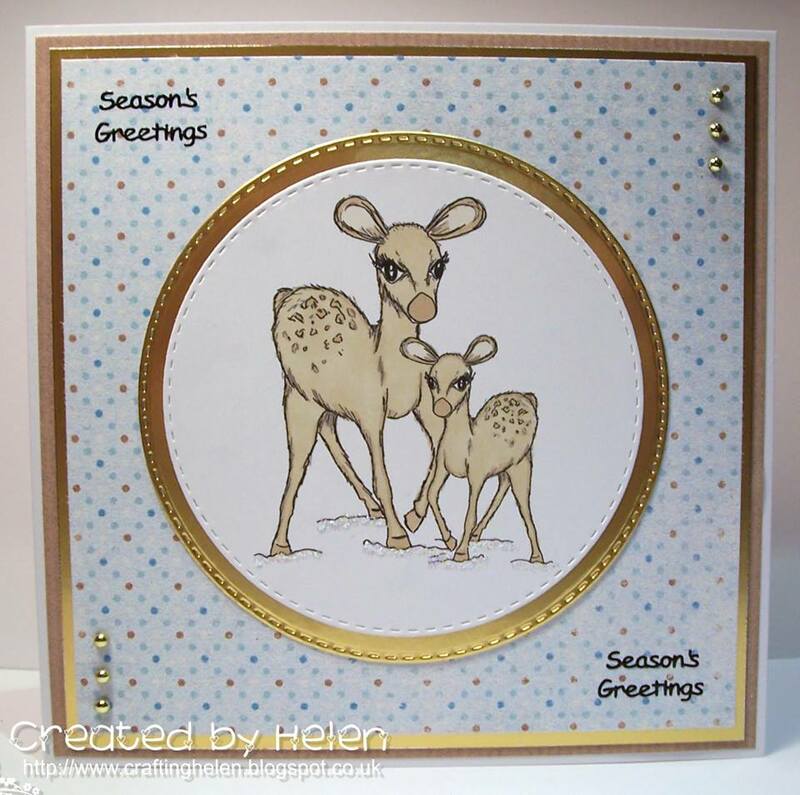 Helen - I've used the 'Maddie Shy' digital stamp download which is here and the 'Thank You' sentiment download which is here. 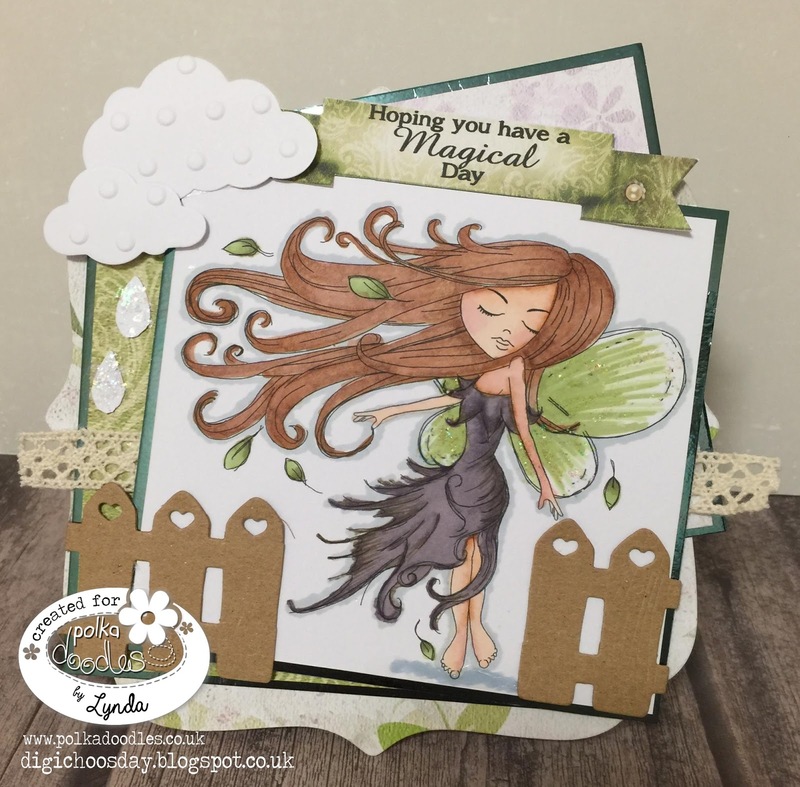 The papers I've used are a mixture of the 'Twiggy and Toots Paper Heaven 5' bundle which is here and 'Eden - Paper Heaven Plain Jane' which is here. Anjie - I have used a page from the fabulous Colour Therapy issue 2, Inspiring Foliage. The stamp is from one of my SU stamp sets. I have used my Sakura Tiara pens that I have had forever. I have embossed a back ground and mounted it on 3D foam, and then cut around the image and mounted that onto 3D foam as well. Great makes from the DT as ever - thanks everyone! 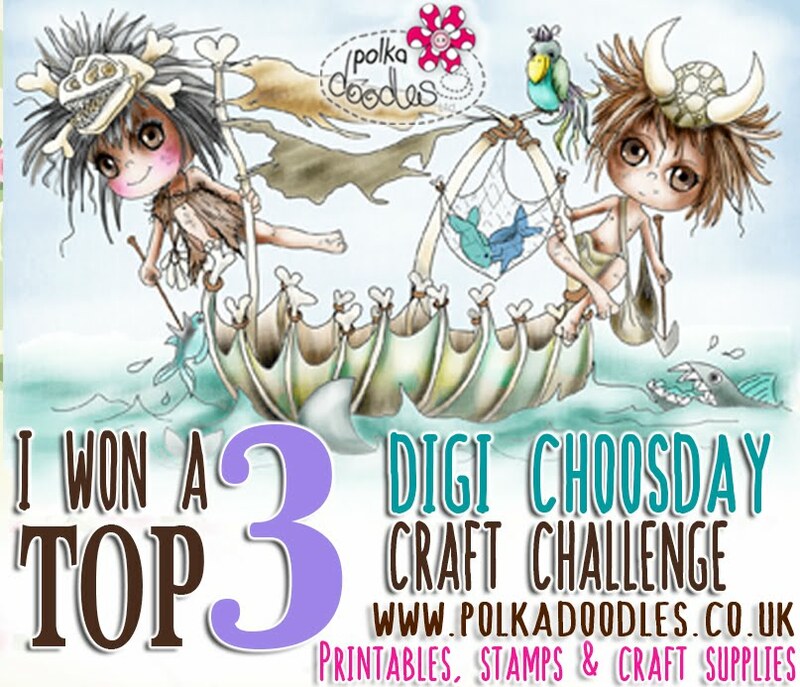 Please email us at sales@polkadoodles.co.uk quoting DCW043001 to claim your prize of £5 worth of downloads from the digi store! 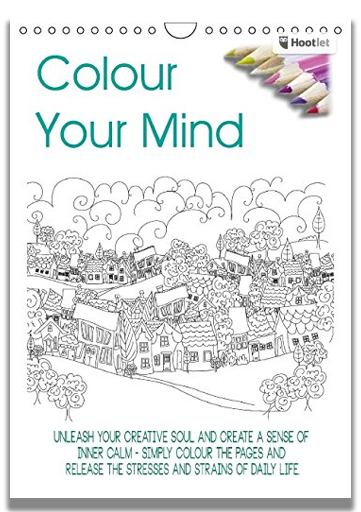 Have you seen the latest in Nikky's Colouring Book range? We now have an amazing Colouring Club which you can join and it's only £1 a week to get loads of fabulous printable colouring pages make sure you check it out HERE! AND as if that wasn't exciting enough we are all thrilled to be able to reveal that you can now purchase her COLOURING CALENDARS online from lots of sellers across Europe! Whoop Whoop, so exciting! They will make great Christmas gifts!! HELEN joined us a few weeks ago now as a GDT and has been a wonderful addition to our team and is now a permanent member of the DT so look out for her fabulous makes each week. Don't forget to visit her blog as well by clicking on the side bar name. GAIL who will be joining us very soon as a permanent member of the DT. We hope that you'll give them all a huge Polkadoodles welcome to the team and visit their blogs to leave some love too. We can't wait to work with them and see their creations. 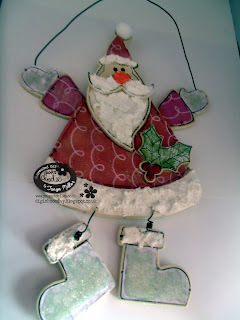 So we want to see your creations with Xmas and Sparkles as the main focus. 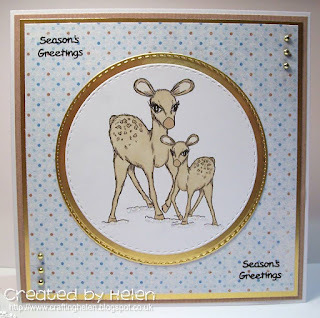 You can make anything you like, maybe a card, a scrapbook layout of even home décor. You can use any products you like to enter as long as it follows the theme for this week. We don’t have many rules but check them out in the side bar if you need to. CLOSING DATE: 24th November 2015 and winners will be announced on 1st December 2015. PRIZES: The random winner (chosen by Random.org) will receive £5 worth of downloads of your choice from the digi store! The winner and top 3 for week 42 can be found at the bottom of this post. Fiona - I have used for my first GDT Make a image called Twiggy bauble from the Twiggy and Toots Festive Fun cd I added some glitter to the frame and to twiggy to make it sparkle. Twiggy and Toots is available as a digital download or cd . Julie -- Christmas and sparkle! Fun! 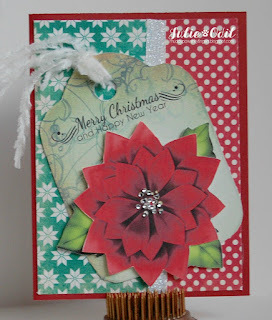 Everything on this card -- papers, poinsettia, sentiment and tag, are all from the Picknix 3, Nordic Winter collection. It's available in Digital Download and CD. Monica.-Have you heard about pocket letters? Those beautiful set of nine 2.5 by 3.5 cards you make to fill the pockets of a letter size page. I love this and I have Christmas swap with my friends. 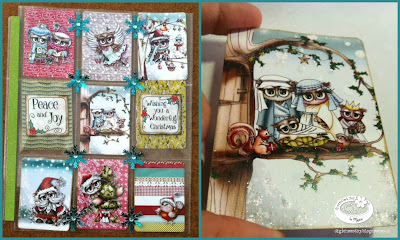 Twiggy & Toots Festive Fun papers, precoloured images and sentiments were just perfect to make my Christmas pocket letter set. 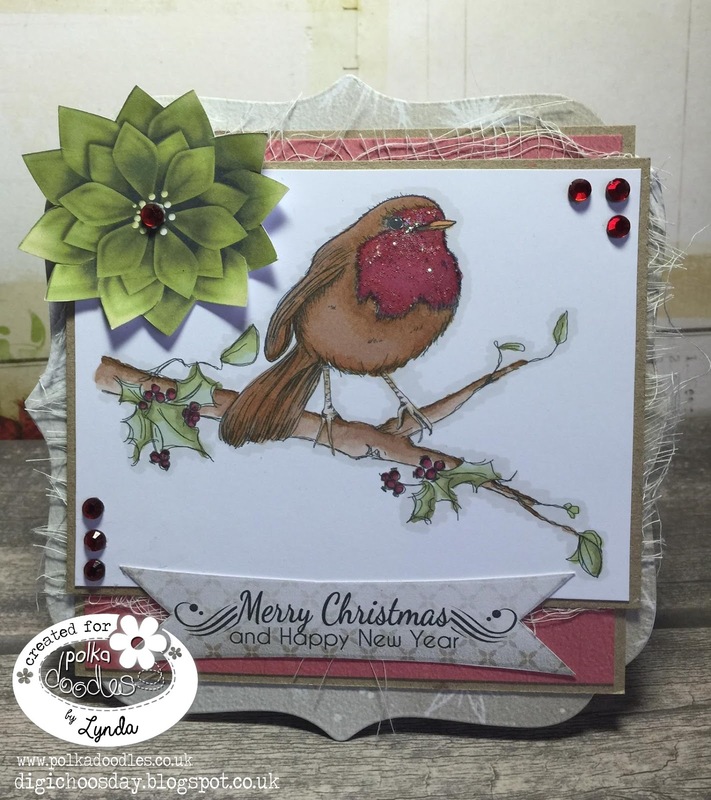 I add lots glitter to some of the images and 3d other. 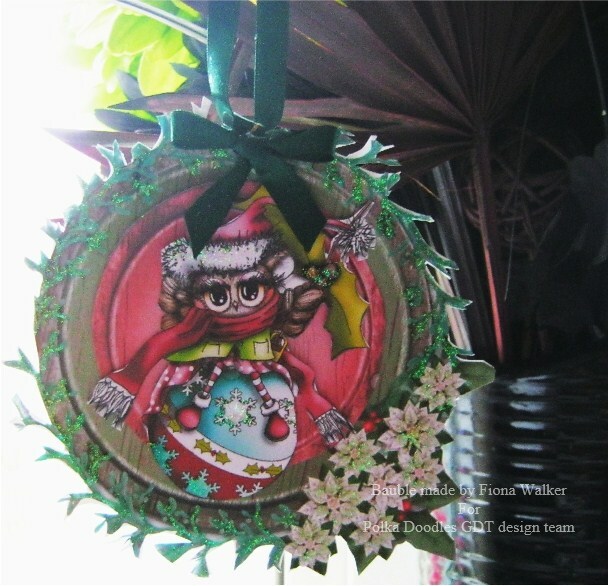 Tanya...This week I've been playing with texture and adding glitter to it by using the papers from Twiggy & Toots Festive Fun (available HERE on CD and HERE on download) on an MDF Santa. There's more pictures on my blog. 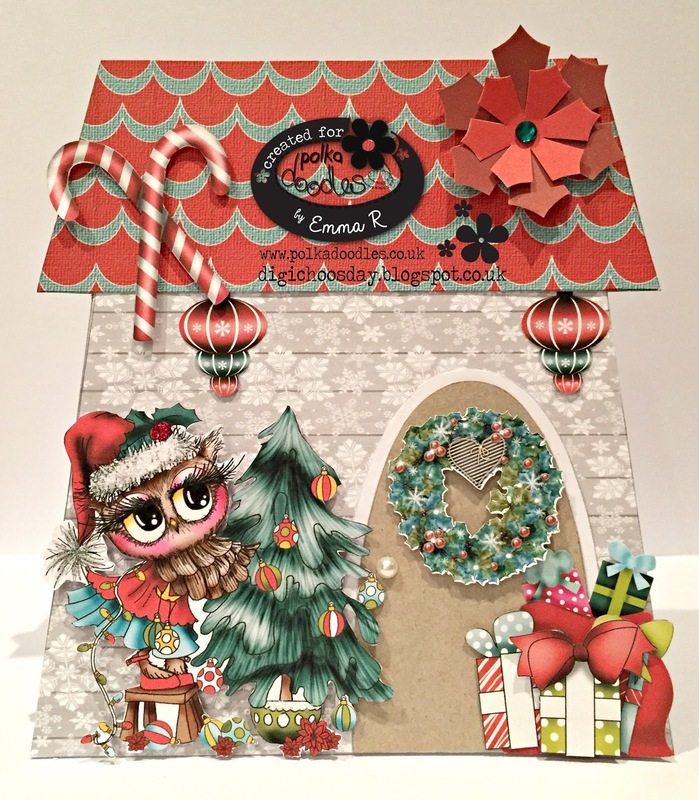 Emma - I just love the Twiggy & Toots Festive Fun collection & it was my go to collection when I saw this challenge. 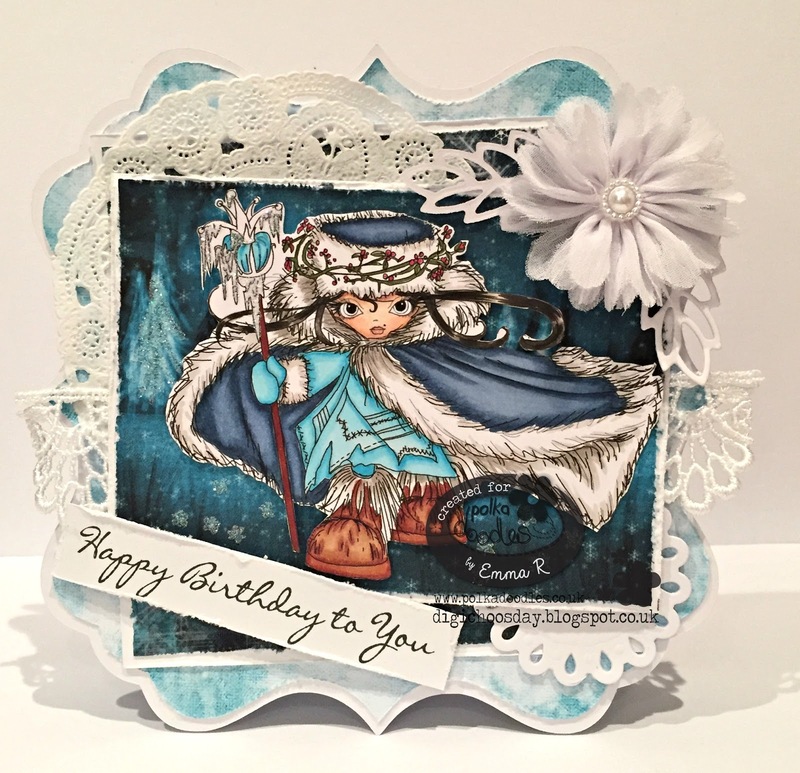 I have used one of the house templates for the base of this card, I have added the pre-coloured Christmas trimming that can be found Here I have added some sparkle to her hat & top of the pot. All of the embellishments & templates are from the full collection that can be found Here. Wendy -What's Christmas with out sparkles! 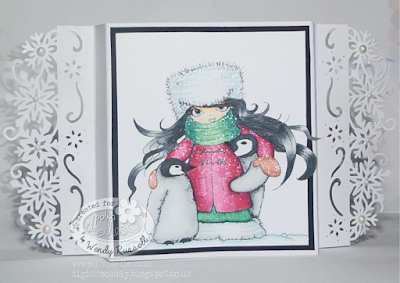 For my image I've used Frosty Penguins from the Octavia Frosted Winter collection. You can also get the image as an individual digi here. My sparkles are from using Sparkle pens. 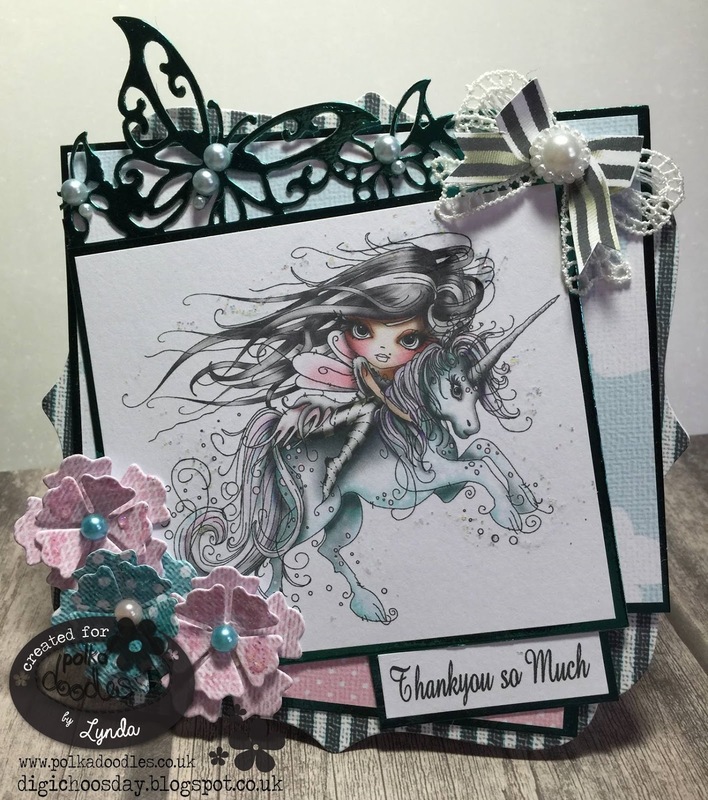 Great makes from the whole team and lots of inspiration for you there! Well done! 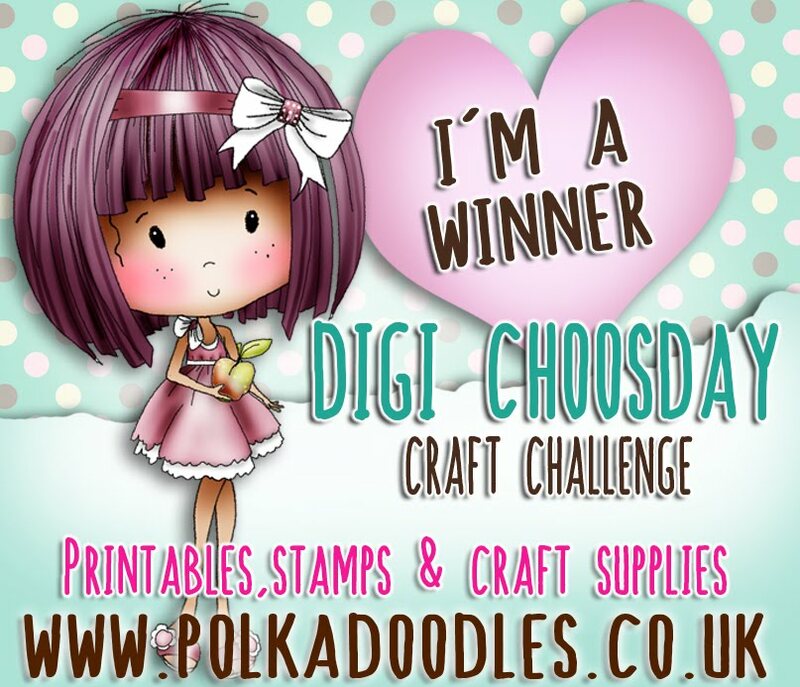 Please email us at sales@polkadoodles.co.uk quoting DCW042001 to claim your prize of £5 worth of downloads from the digi store! Well done everyone! Grab your blinkies from the side bar!